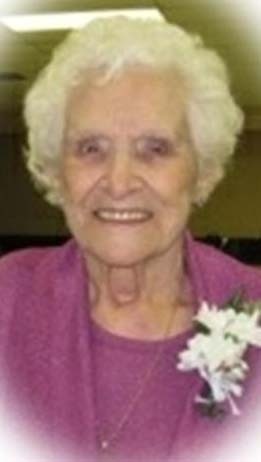 Obituary for Alice Margaret Borle | Prairie Sunset Funeral Home, Ltd.
With saddened hearts the family of Alice Borle announces her passing on February 2, 2019. Alice is survived by her four sons. Dan and Annette: their children Kyle, Nicholas, Allen, Calvin, Amy and Sean; their grandson, Logan. Alan and Claudette: their children Shane, Christine, Michelle and Rob; their grandchildren Makayla, Braden, Kellan, Jackie, Ayla, and Alice. Richard: his son, Gary and Dawn; his grandchildren Parker, Dakota, Cierra, Leah, Emma-Leigh. Rene and Elaine: their children, Eric, Julie and Heath, Jeff and Chantelle; their grandchildren, Ryker, Ella, and Griffin. Alice was predeceased by her husband, Maurice, in 1980; her son, Raymond, in 2015 and her siblings, Mary, Joe, Roger, Gerry and Norbert. Mass of Christian Burial, St. Emerence Catholic Church, Rivière Qui Barre; Saturday, February 9th, 2019 at 11:30 am. Interment St. Emerence Catholic Church Cemetery Memorial Donations St Emerence Building Fund.